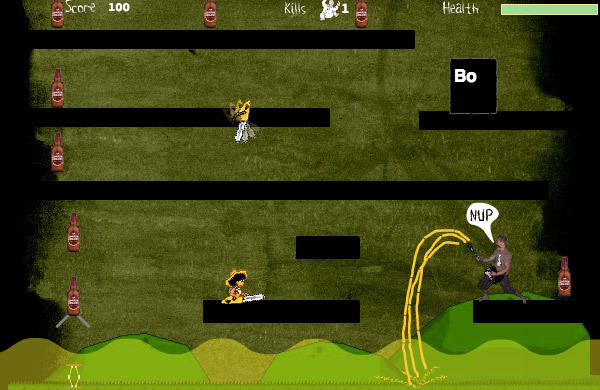 A collection of flash projects from back in the day when flash was the king of online interactive media. Obviously you need flash installed and activated to view these, and be warned, some of the projects aren’t optimised for online usage so might take a while to load… Sorry about that. This is the first (and last) time I attempt pixel art. The idea was to create a small interactive city for the new VU multimedia web site. I did all of the pixel art in photoshop and animated it in flash. I think I spent around 100hrs just making all of the pixel people/buildings/cars etc. It was a lot of fun, and I learnt a lot about the techniques involved in pixel art. This was a web site made as part of work placement at Reactive Studios in Fitzroy, Melbourne. Click Here for a larger, better quality in-situ version of the city! This is a interactive flash project made for hepatitis C awareness week. The idea is to raise awareness about how you contract Hepatitis C, but my project focuses on the risk of contracting it through unsafe procedures when re-using needles and tattooing equipment. I won the best in show award for this one, so check it out below!